Hello to all of you out there in the amorphous matrix of land caring. 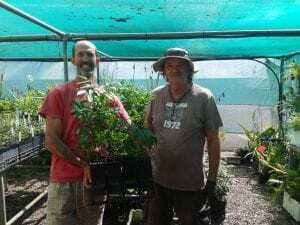 It has been quite awhile since I put fingers to keyboard for a newsletter article; this time it is from my new role alongside Tony as co-manager of the Gympie Landcare nursery. Yes, I have been dragged, almost-kicking-and-screaming, from them thar hills, by the previously unidentified God/ess of that modern blight, cash-flow. I wonder what the Greeks would have imaged for such a deity – something between a giant octopus and a vacuum cleaner? Capitos, the all-consuming. But I digress, before I’ve even started! And it’s not like I ended up in a cursed job. Au contraire! 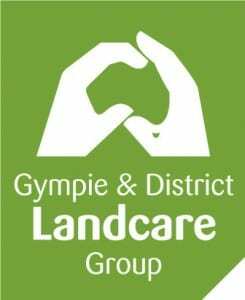 Through 2018, I began field-work with the Gympie Landcare Contract Landcare Services (CLS) team, bringing my extensive and intensive first-hand experiences to more locations in the Gympie region. I also made a faux pas of expressing some interest in nursery activities. It then later came to my attention that Tony, bless his green fingers, is considering a new career in full-time cruise-ship reviewing – without actually having to write the reviews. I’ve heard it colloquially referred to as retirement. And so, as 2018 drew to a close, I found myself gathering up some reins in and about the nursery. And what a myriad of reins there are to gather! It is a busy time indeed for the nursery. On top of the steady flow of public customers, the CLS team is expanding, with many of their works including planting of nursery tubestock, literally by the thousands. It is a boom in propagation and production that the nursery has not catered for in quite some time. The rhythms of nature also bring another quite timely boom: the not-unexpected glut of summer fruiting and seeding, from which the nursery volunteers are being kept quite honest by the volume and rate of seedling production in the summer heat. Of course, this escalation in production brings several usual nursery aspects to the fore: is there enough bench space for all the plants? Will the irrigation systems keep up? Will the volunteers get lost under a forest of greenery? Is there the right amount of the right plants being propagated? Then, there is the oft-maligned aspects of keeping up-to-date with general administrative and safety elements. To top it all off, I’ve also heard whisperings of Modern Technology trying to graft its way into the nursery, from seed-bank records to stocktaking, from customer-service to critter-cams. I myself may have even been guilty of mumbling such blasphemy! Wander into the nursery for a casual browse though, and most of this will go unnoticed. It is still in the same place, the same shape, with lots of green-coloured things sticking out of black plastic containers and many of the same familiar faces going about their duties (with the rest of their bodies, thankfully, still in tow with said faces). The changes will be incremental – the adage of ‘if it ain’t broke, don’t fix it’ seems to have served well to date, but there is always ample room to arbitrarily re-define ‘broken’. So to close, I will leave you with a somewhat back-to-front introduction to myself, for any of you with whom I am yet to acquaint, or for those of you whose acquaintance has gathered dust. Though I will break in character this time and dispel with meek, for there is plenty to be modest about. My life, from even before I knew the term ‘NRM’, has been infused with an awareness of nature and human interactions. I grew up in a small fishing community on the world’s second-largest sand island, barely a sea-breeze’s distance from Brisbane. My father operated a small sawmill that put ‘reduce-reuse-recycle’ in real terms, not least in attempting to redress the loss and waste of timber resources associated with mining operations. Then there was the controversy of coastal developments and the bureaucracy of fire management. The elements of depleting fish stocks and the impacts (good and bad) of legislation on primary industries. All this and more, before I even finished primary school! The one thing I didn’t learn in primary school though, was the word ‘racism’. That was a concept that I only discovered through high-school and beyond, as I learned that my childhood experiences of indigenous cultures and Australian history were more than the norm. Perhaps it was not just the setting that bred my appreciation of NRM. Whilst some other children may have absorbed cartoons and comic books, I devoured National Geographic articles and (Sir) David Attenborough documentaries. Though I was still partial to a cartoon or two. Fast forward through an Honours Degree, two years working-holiday around the back-paddocks of Australia, four years working in a tertiary education/research field station, and twelve years attempting to ‘manage’ 240 mountainous acres near Gympie, brings me to this point. Those last 12 years encompass my greatest growth in the realm of landcaring. Native seed collected by the kilogram. Easily 100,000 tubestock propagated by my own hands, and perhaps an order of magnitude more plants killed through myriad unorthodox experiments. Perhaps 10,000 tubestock planted, mostly on the family property but extending to other properties throughout the Sunshine Coast/Noosa and Cooloola/Gympie regions. I’m now overseeing my second community Landcare nursery and have built two ‘backyard’ nurseries (mine is not your average-sized backyard). I’ve experienced the trials of NRM funded-project management, of devolved grants, and straight-out-DIY. I’m by no means an expert on anything, nor even as skilled in NRM as many of my colleagues. But I have developed a knack of observation, of listening to the land, of articulating those whispers. I have learned just enough to know how ignorant and small I am. I have learned that we don’t ‘do landcare’ for the sake of nature. Nature will take care of itself (albeit with a few scars to heal) once all us humans are dead and gone. Landcare is about taking care of ourselves, by paying our respects to the very things that give us our existence. It is a concept that I have come to recognise in many indigenous paradigms, a concept quite foreign to the control-paradigm bestowed upon us by our colonial forebears. But that, dear readers, is but one of many topics for me to ponder in future articles.